Your threads are a fountain of information!!! I live in northern VT along the Canadian border to the East. Our growing season is from end of May to about October, though i find alot of the growing slows/stops mid to late September due to the increasing cold nights and chillier days. I love pumpkin growing and am in a yearly contest with a co worker that usually includes alot of smack talk. I would love to knock his socks off next season with a giant pumpkin. I have had touch and go success with my pumpkins. Last season was a largely smallish size pumpkins and one extremely largish one one that just popped up one day at the end of a runner and just flew up in size. this year I went with a larger breed. I furtilized the bed with year old cow manure and kept it well watered on a daily basis. reading through this thread I see I may have done quite alot wrong. I have a tilled area approx 6 feet by six feet- tilled in manure and then plant about 9 - 12 seed spaced evenly apart in three rows. I allow what ever comes up to grow and then cut off extra female blossoms after two fruit have established. The runners obviously spread over alot of the local yard area. I have read through your excellent threads and enjoyed them alot. learned quite a bit. I have a few questions i would like to ask. 1. how far apart should a hill be from one another. I realise that runners can travel quite a ways I would like a few pumpkins but don't have the room to space hills thirty feet apart. I am going to make my patch alot larger but I do have limits as this is just a home garden on less then an acre of land, not including my house and my actual vegatable garden. 2. it appears that alot of people are using drip hoses for water delivery, is this the best way to supply water versus a garden sprinkler. is this something that can be purchased in stores? Also I see alot of people mentioning watering once a week. is this enough. i know this is a very water dependant vegatable and that seems pretty low. Thank you for you excellent work on this site and everyone who contributes to the knowledge base. Atlantic giant (pumpkin) needs hills about thirty feet apart. Your hill should be liberally supplied with compost. If you really want a giant pumpkin your going to grow from good seed (an internet search is probably due). You want seed from a record holder (and there are lots to shop from). Now I like NC Weeks, but his Atlantic Giants are decades away from being a record holder. Look for a more recent record pumpkin. 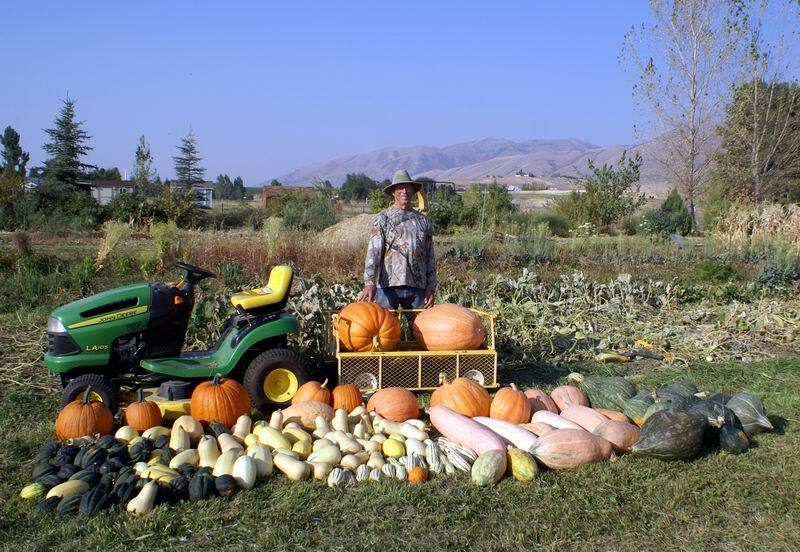 Inasmuch as your pumpkin will need to put on 35 to 60 pounds a day, you are going to only keep one fruit per vine, and water every day it does not rain. Liberally supplied with compost means (to me anyway) about a pick-up truck load of finished compost per hill. Last I knew record pumpkins are topping 1600 pounds. geekstuffff, what size pumpkins have you been getting? Here where I live, the season is not long enough for Dills Atlantic Giant. I can go with Big Max and get some up to 200 pounds. Just wonder if you have long enough season for the Dills? Ya, dig a pit and fill it with compost or aged manure, cover that with 6 to 8 inches soil. Plant a hill on that. 5 seeds is a hill in my book. If 4 come , just right. You may do better to start the seed for transplanting out when the weather is warm? One vine on a spot may do better than if the spot is shared with another vine or two? Once you get a nice pumpkin set on, clip all others on same vine. way I got some nice round pumpkins instead of squashed ones from being on their side. Its been a long time since I went for a giant. I just like to grow lots of Jack'O'Lantern types these days. I get a kick outa the kids when they come to pick out a pumpkin. My goodness, they have been after them already for fall decorations. Thank you for the response . I don't know what I had for seeds exactly. They were a Burpee breed that stated they would grow up to three hundred pounds. Obviously not a reward winning breed. ill be buying quality seeds for next years attept. I don't know if they are anywhere near forty pounds right now. I'm not a good judge. There a few nice sizes . My growing season is about three and a half months of warm weather which I could extend by a few weeks by growing indoors . In this area, we generally plant last month of May to avoid frost. Frost strikes third week of September. So you have about the same growing season as James (jal_ut) does. He does great with his growing season, so you can learn from him about short season growing. I don't think it probably makes sense for either of you to aim for thousand pound pumpkins in your season; that's for the folks in the South with six months or more of warm weather. But if you care enough to work that hard, start early, etc, you probably could get those 200+ lb pumpkins. One trick to try is in early spring, cover the soil where they are going to go with black plastic - helps the soil warm up faster, so by the time you put the pumpkins out (that you started indoors under lights on heat mats), the soil will be not just unfrozen, but nicely warmed up. Personally, I not only don't have room, I don't care enough to put that much time, energy, water, fertilizer, etc in to something I'm not even going to eat. Over many years of planting, I have adopted the date of May 5 for planting corn and squash. Yes, I may have a few more days of frosty mornings, but usually things make it. More cold sensitive things I wait till June 1 to plant. Frost comes around the first week of September most years. This year we haven't got frozen yet. Any way, my warm growing season is maybe a couple days over 4 months. Of course it varies some from year to year. Its a game we play, dodging frost. One can always cover plants on cold nights to save them. Many times have I ripened tomatoes under wraps. Things with good frost resistance can be planted in the early spring as soon as the soil dries enough to do it. Onions, peas, and carrots on that list. Have fun! Aw, too bad you don't have the room. I get a kick out of the kids coming to the garden to choose a pumpkin. It is fun. I seldom eat a pumpkin either. If I want a pumpkin pie I go for a Hubbard squash which has much better flavor. The great thing about growing pumpkins and squash is that you get loads of food. So much you can't begin to eat it. lol i actually have a recipe for pickled pumkin that it really good. it is a lemon based brine and very different. I don't eat pumkpin other then that either. I do have the fun of smak talking all season with my co worker so tahts the real fun, that and seeing how large i can get my pumpkins. I will definately taking it to the next level next year though. i already cant wait for the winter season to pass by. I also enjoy handing out my pumpkins to family memebrs and friends with children. i love tackling a big pumpkin carving project every year as well. New to gardening - need help with basics!